The following quote comes from Ban Billboard Blight's response to "a response by Stuart Magruder to a March 26 article in the L.A. Times titled 'L.A.’s Great Signage Debate' by architectural critic Christopher Hawthorne." Amazing. It also happens to be an eloquent summary of the difference between place signage and advertising, sometimes referred to as first party signage and third party signage. "The more insidious mistake that Mr. Hawthorne makes is his assessment of what is and what is not advertising. He rolls into one category the “thrillingly tall billboards…on the Sunset Strip” with the Hollywood sign, the LAX sign, the address numbers on the Caltrans building, and several others. Unfortunately, only the fist example - the billboards on Sunset Strip - is advertising; the rest are place signs, not advertising. The difference between billboards and place signs is crucial. The first and most obvious difference: place signs are about the place they adorn. They refer to themselves or to the building that they are on. The best ones, such as the Hollywood sign (which started its life as a billboard for “Hollywoodland” but now designates the place both physically and culturally), are landmarks, helping us get around the city and understand where we are. Billboard advertising is just the opposite. It is placeless; it disorients. There is no connection to what is advertised and where the billboard is located. Billboards make us lose our way in the city as the same product is advertised all over." Advocates of advertising's removal from public space do not wish for an austere environment, free from anything but boring brick walls and sheer facades. In fact the opposite is often true. It is the selfish nature of advertising's use of public space that is at the heart of our complaint. Instead we advocate the removal of the selfish with replacement by the personal, individual, and inherently altruistic acts of peoples invested in their space for reasons other than profit. Personal interaction with public space often leads to moments of grand visual elegance, teeming with life affirming qualities that stand out against the background of the city. Unlike a billboard whose advertising content we shrink away from, public use of public space is revelatory and engrossing. 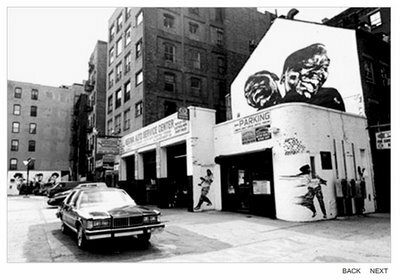 The above image by WK Interact once created a physical place in the city that truly inspired me. It was replaced some years after its creation by an advertisement and the entire corner lost it's identity.